I think it might be a little too early to let Ben pick out his own clothes -- what do you think.. but oh how he loves these boots..
WOW - he's such a poser... Too funny. 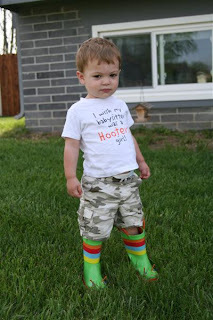 I LOVE his galoshes! I've got some black ones with white polka dots and teal trim --wish I could wear them every day like him!